Though the House is supposed to vote on immigration Thursday, a conservative leader within the GOP conference says the bill "is not ready for primetime." On Wednesday afternoon, House Freedom Caucus Chairman Mark Meadows, R-North Carolina, had what looked like a heated exchange with Speaker Paul Ryan on the House Floor during votes. 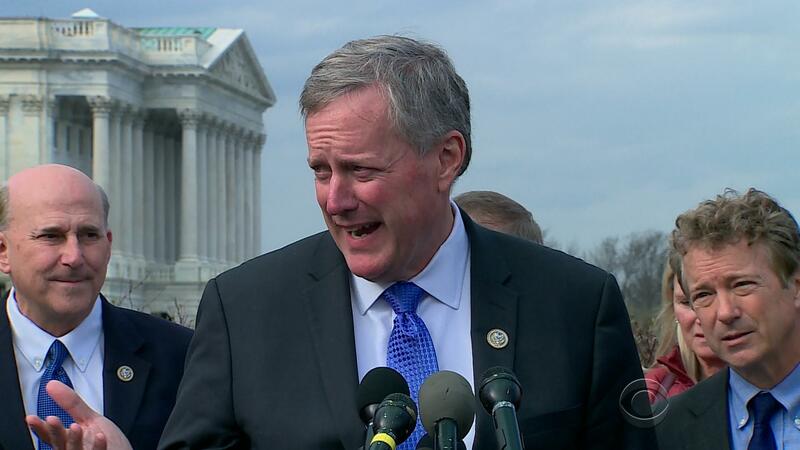 When he left the chamber, Meadows complained to reporters that the draft of the compromise GOP immigration bill, which he helped negotiate and which he had agreed to last week, had "a number of issues" and left out items he claimed had been part of the deal. However, he declined to be specific about what those issues are. "The compromise bill is not ready for primetime and hopefully we'll be able to make it ready for primetime, but today it's not ready for primetime." He added that Speaker Ryan did not say he was willing to make changes to the measure. But losing the support of the House Freedom Caucus, a group of about 30 conservative Republicans, could sink the compromise bill, which is slated to get a vote Thursday evening alongside a more conservative measure. Aides were already privately warning before the blowup that the bill would have trouble getting enough votes to pass. Rep. Carlos Curbelo, R-Florida, one of the moderate negotiators who led the effort to force a vote on four other immigration bills, had a different view, though. "I think some members sense there's growing support for the second bill and they're starting to get very anxious about it," he told reporters, noting the support from Attorney General Sessions and Homeland Security Secretary Kirstjen Nielsen, both of whom met with Republicans Wednesday to talk about the legislation. Sessions said the administration supports both the conservative and the compromise bill. Curbelo said the argument was over process. Curbelo criticized his conservative colleagues for trying to make changes at the last minute. "We worked very hard to keep our commitments and to be flexible throughout this process, and I truly hope that colleagues who up to a couple days ago were working with us constructively would now turn around and blow up our agreement," he said. "We're also not going to let people just step all over us and try and rearrange what was agreed to at the 11th hour." Meadows' spokesman tweeted later Wednesday evening that Meadows "had a good follow-up conversation with Speaker Ryan just now, after today's floor events. Working to resolve a communication issue on the compromise immigration bill." House Speaker Paul Ryan said Wednesday that the House would aim to pass legislation Thursday that will "take action to keep families together" while also enforcing existing immigration laws amid growing pressure over the administration's "zero tolerance" policy. Under the bill, Ryan says, "families will remain together under DHS custody throughout the length of their legal proceedings." "We do not want children taken away from their parents. We can enforce our immigration laws without breaking families apart. The administration says it wants Congress to act and we are." Rebecca Kaplan covers the 2012 presidential campaign for CBS News and National Journal.